Order Desk can pull your print on demand orders in from your shopping cart(s), sync your print details into them, and then submit them to DTG2Go. As DTG2Go fulfills the orders, the shipment details will be sent back to Order Desk and on to the original shopping cart if your store is set up for it. This guide explains how to set up and use the DGT2Go integration. To set up the DTG2Go integration in Order Desk, you'll first need to login to the DTG2Go Portal. While in DTG2Go, enter either your EasyPost API key or your UPS account details, so DTG2Go can print your labels. If you skip this step, they will not accept any orders from your Order Desk store. If you need help with this, please contact DTG2Go. From the DTG2Go portal, you will also need to get your API Key. This can be found from the API Credentials tab. Copy your API Key. In Order Desk, to enable the integration, click on Manage Integrations in the left sidebar. Under the Print on Demand tab, find and enable the DTG2Go integration. Paste your API Key and select Production (Live) or Sandbox, based on the type of key you have, then click to Connect. Once connected, you'll have a few settings to adjust in the DTG2Go integration. Select the folder you want orders to be moved into after they are successfully sent to DTG2Go. Select the folder you want orders to be moved into as DTG2Go sends shipment details back. Select the folder you want orders to be moved into if they are canceled at DTG2Go. Your webhook URL is what connects DTG2Go back to Order Desk so they can send shipment details automatically as they fulfill your orders. Copy the URL, and go back to the DTG2Go portal. In DTG2Go, click Edit Profile and paste the URL in the Webhook URL box under API Options. You will see some webhook types underneath this. Leave them checked. 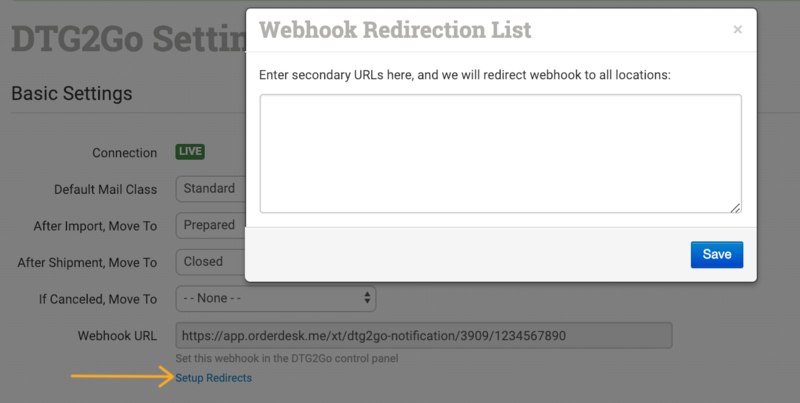 If you have more than one DTG2Go integration set up in Order Desk for the same DTG2Go account, you will need to create webhook notification URL redirects following the instructions in the next section. If you have DTG2Go connected to more than one Order Desk store for the same DTG2Go account, instead of adding the notification URL for each connection to DTG2Go, add any additional notification URLs from other connections to your primary Order Desk account. To add these, click on Setup Redirects. Add one URL per line. When DTG2Go ships your items, these redirects will help the shipments find their way back into the Order Desk store the orders came from. For more information on what these product settings within the DTG2Go integration are for, please refer to the Print on Demand Product Settings guide. Initially, getting your orders ready to send to DTG2Go is going to take some time before everything is in place for it to happen automatically. For detailed instructions on how to use Order Desk with your print on demand orders, please take a few moments to read the print on demand fulfillment guide. print_sku Required. DTG2Go Product Code. The API Documentation tab in the DTG2Go portal has all available SKUs. print_url Required. Link to your artwork. For multi-location prints, use print_url_1 through print_url_7. Google Drive links do not work for DTG2Go. print_location Required. Locations are: Front, Back, Left Crest, Right Crest, Left Sleeve, Right Sleeve, Neck Label. If Chest is entered, it will be converted to Crest. Anything including the word "front" or "back" will be converted to Front or Back (e.g., fullfront will become Front.) For multi-location prints, use print_location_1 through print_location_7. print_preview Optional field for multi-location prints. Use print_preview_1 through print_preview_7. If an image value is in the item metadata it will be used for location 1.
print_height Optional field for multi-location prints. Use print_height_1 through print_height_7. Set values in inches. print_width Optional field for multi-location prints. Use print_width_1 through print_width_7. Set values in inches. color The API Documentation tab in the DTG2Go portal has all available colors. Colors will not be converted in Order Desk. We cannot convert colors for you. If your incoming colors need to be converted, contact Order Desk support. size The API Documentation tab in the DTG2Go portal has all available sizes. Sizes will be converted to standard DTG2Go requirements. For rush shipping, set the shipping method on the order to "Rush" either manually or with a rule. The following fields can be set as checkout data or order metadata to add or change the details that are sent to DTG2Go about the order. PackingSlip A URL for the PDF to be included as the packing slip on the order. Details here. MerchantCustom1 Special override for the MerchantCustom1 field if requested by DTG2Go for special projects. MerchantCustom2 Special override for the MerchantCustom2 field if requested by DTG2Go for special projects.